In the process to produce cement, power, steel, aluminum etc. , raw material and other inputs have to be transferred from mines or receiving stations to the point of processing. The distance over which these materials are transported can be large with number of transfer points and chutes ,through which they are transferred from one conveyor to another. At each such transfer point the chute through which the material is guided to the receiving conveyor material tends to build up inside the chute especially during monsoon or if the material is otherwise wet. To protect itself against such blockages, it is essential that every chute/hopper installs instruments to measure the material build-up and provide an early warning as soon as it tries to exceed the set level limit. The feeding process can then be stopped to prevent the build-up. Toshbro Controls Pvt. Ltd., offers many solutions for reliably and accurately detecting a jam in the chute/hopper. thereby eliminating plant downtime, minimizing losses and improving productivity. All our detectors are suitable for outdoor installation and protected against deposit of fine particles causing false alarm or stoppage of conveyor. 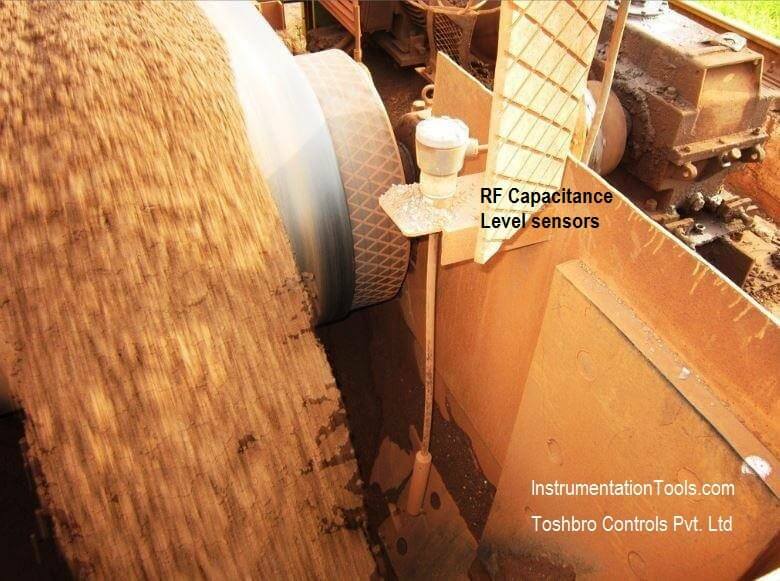 RF Capacitance Level sensors work on the time proven RF Technology. The probes designed specifically for this application through many years of experience offer reliable solution to protect build-up & prevent occurrence of blockage. Flexible probe ensures that the material falling on probe does not damage it. 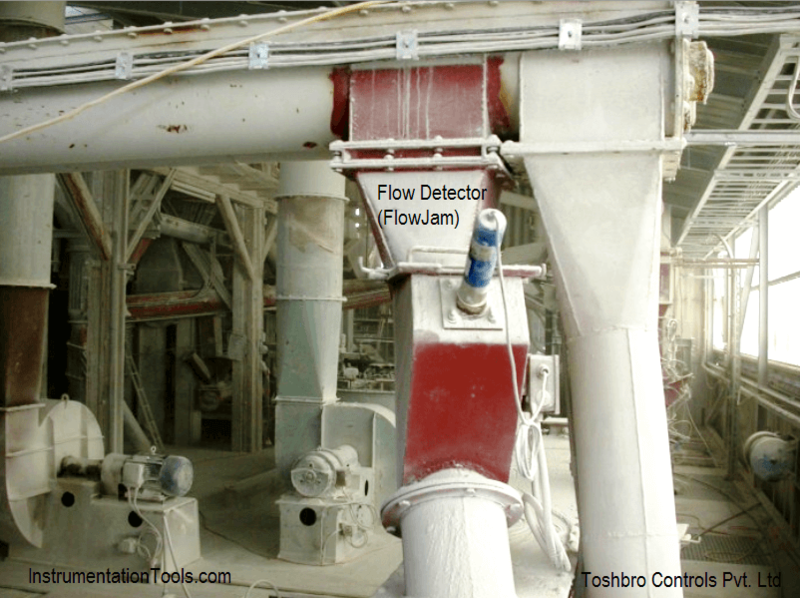 The FlowJam can be installed in the hopper/chute and also at the discharge point of the conveyor to monitor the flow of material. As soon as the material flow gets interrupted the FlowJam sends a signal. 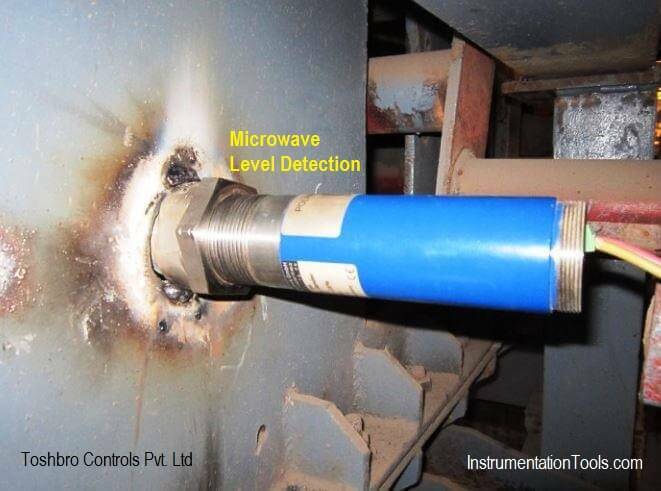 It consisting of a transmitter and a receiver is based on microwave technology and can be universally used as a level detection for all types of solid aggressive, high temperature material in silo, bunkers, duct or shafts at free falling stretches.